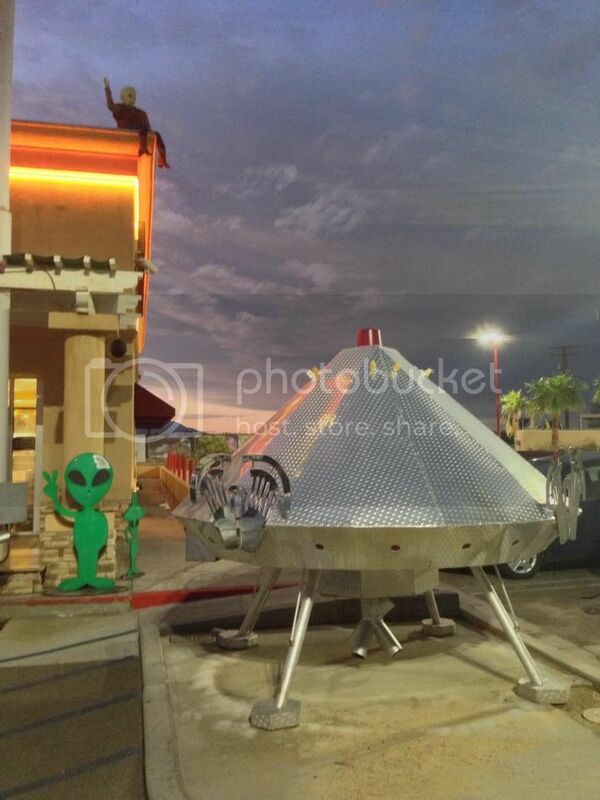 On Katie and my way home from Las Vegas we stopped at Alien Fresh Jerky in Baker, CA. 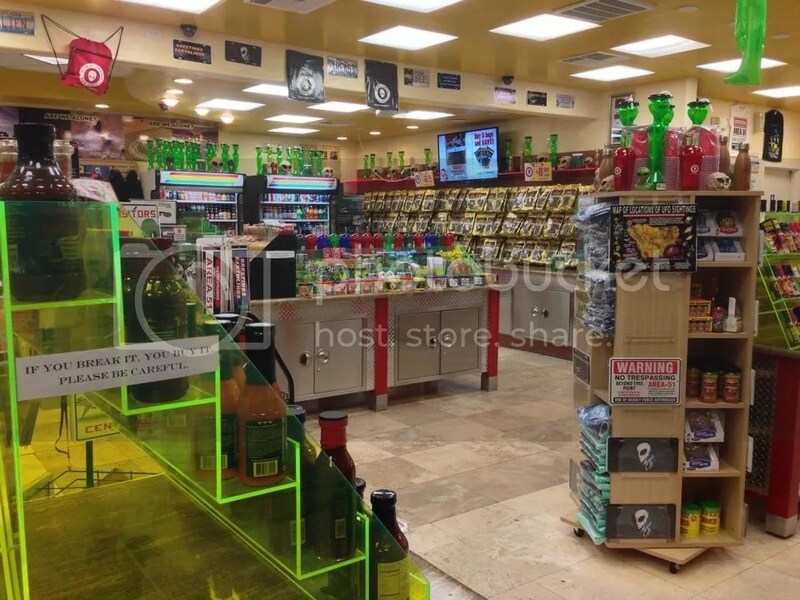 While it was originally established in Crystal Springs, Nevada, the store moved to Baker in 2002. I had never been there before but it is one of those places that many people stop along the route between Los Angeles and Las Vegas as a fun little break and I was not disappointed. As we pulled off the freeway and up to the front door the place looks so intriguing. 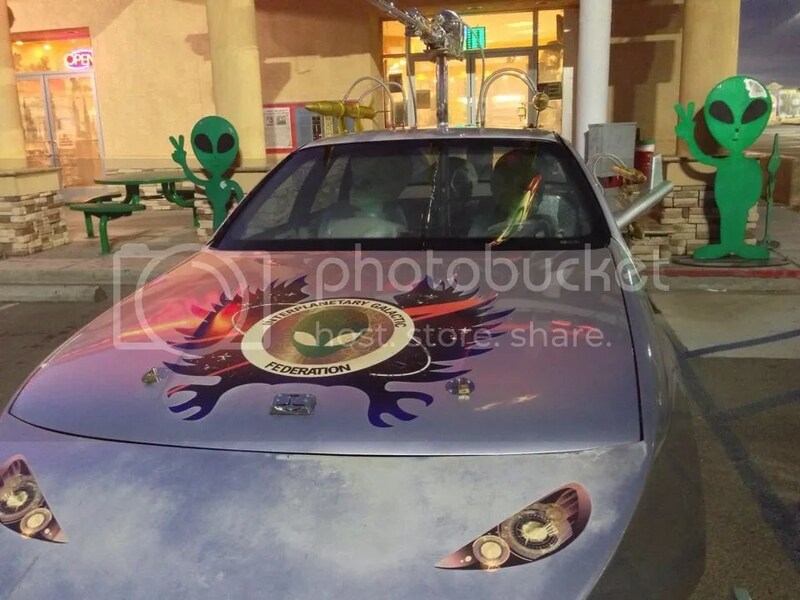 There’s a car in the parking lot with three aliens in it, some of which move a little. There’s also a spaceship that for a dollar lights up and talks. 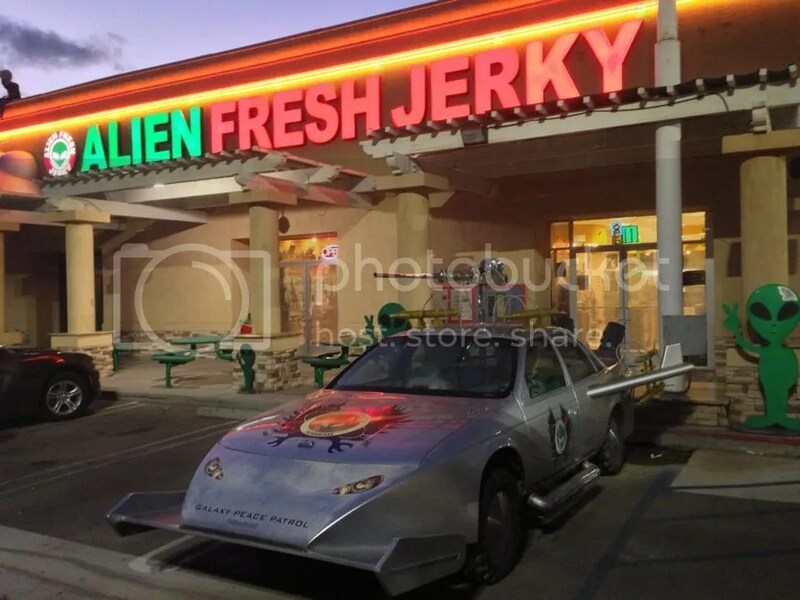 While it was hard to hear his whole message, I’m pretty the sure he says something along the lines of stop at Alien Fresh Jerky to get some jerky. It was kinda cute, I just wish the spaceship would have moved and maybe looked like he was taking off or something. Then it would have been worth the full dollar. 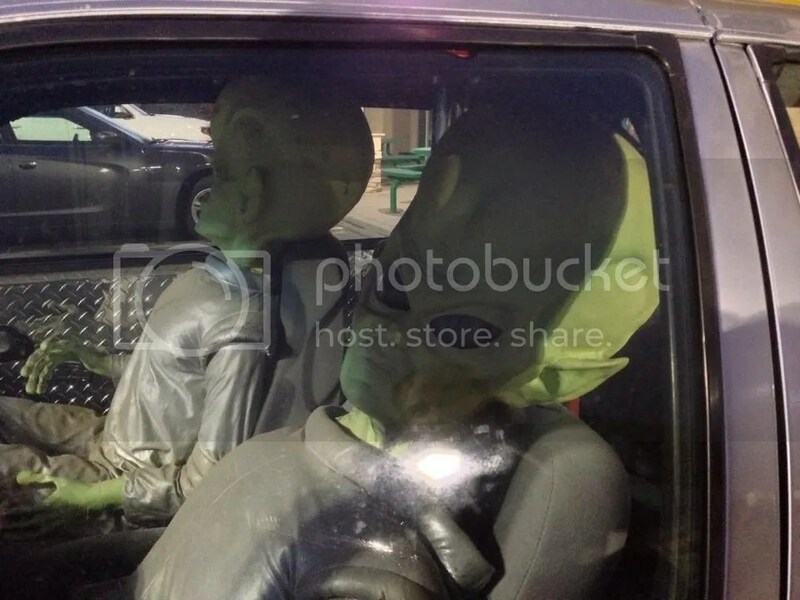 We headed inside and they had a ton of alien trinkets and gadgets from alien parking and warning signs to alien blowup dolls to alien labeled backpacks, magnets, and bumper stickers. You name it they probably had it with an alien on it. 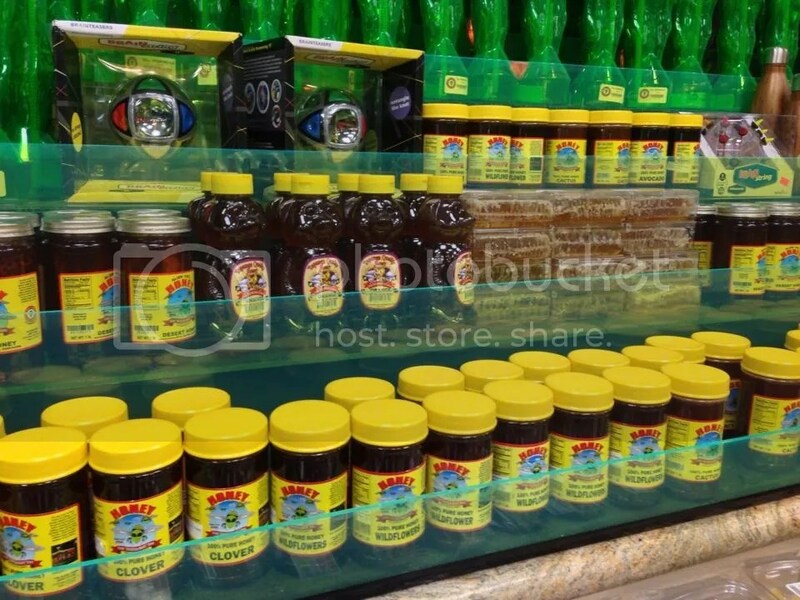 They also had numerous options of beef jerky, hot sauce, and honey. The jerky was $8.99 each or 3 for $25 so we decided to get three bags of jerky and one container of Desert Honey. They had small samples so we were able to try two of the three before we had even purchased them. 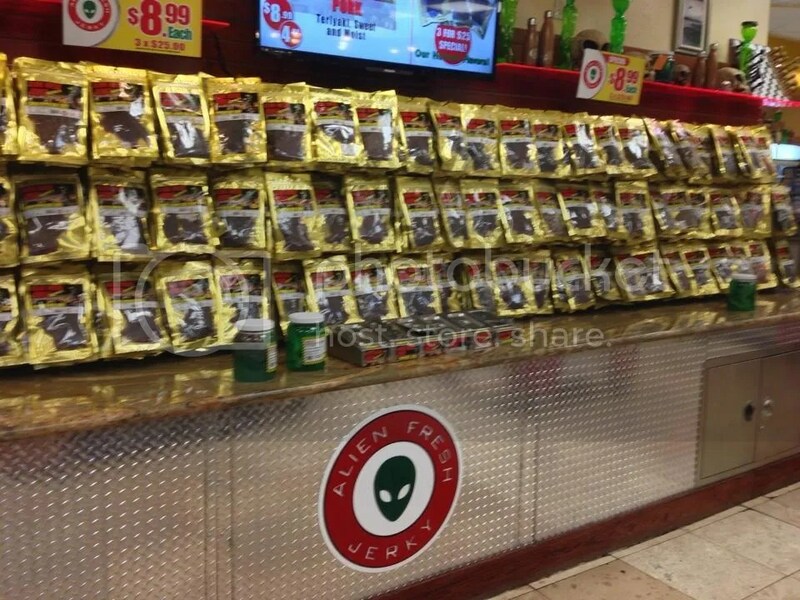 We choose Abducted Cow Beef Jerky, Pepper Teriyaki Beef Jerky, and Honey Chipotle Beef Jerky. They were all delicious, my favorite was the Abducted Cow Beef Jerky, and they took us a couple of weeks to finish. As we left we received a coupon for an online purchase, buy 9 get the 10th free. We probably won’t use it since we don’t eat that much beef jerky, but I could see how some people might really need or want it. 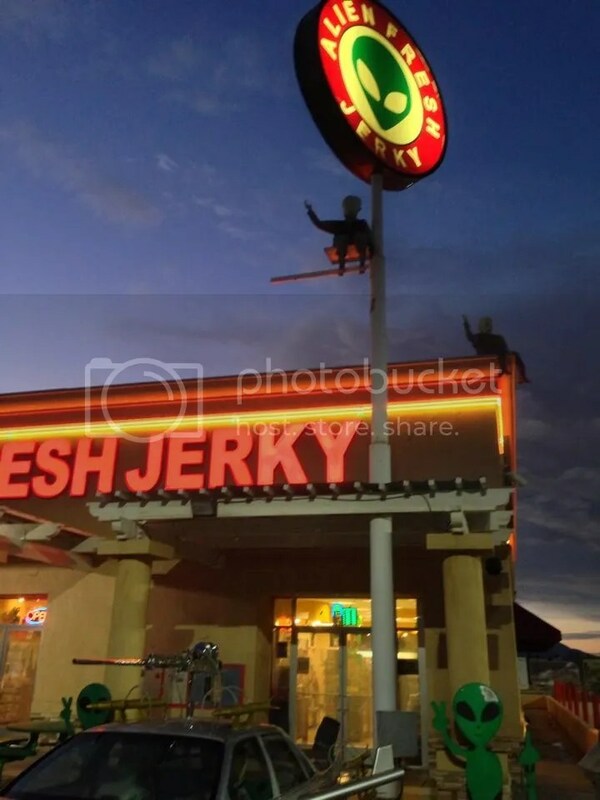 If you’re ever driving from LA to Vegas or back you should be sure to stop and check out Alien Fresh Jerky. It’s a fun little store that everyone can enjoy. And if you aren’t driving in the area, but still want some Alien Fresh Jerky hit up their website and get some shipped out to you today! 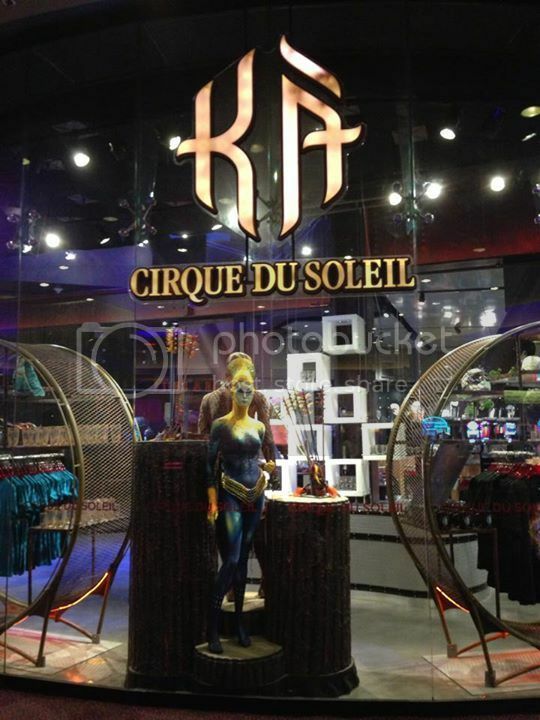 One night while Katie and I were in Las Vegas we decided to go to a Cirque Du Soleil show. 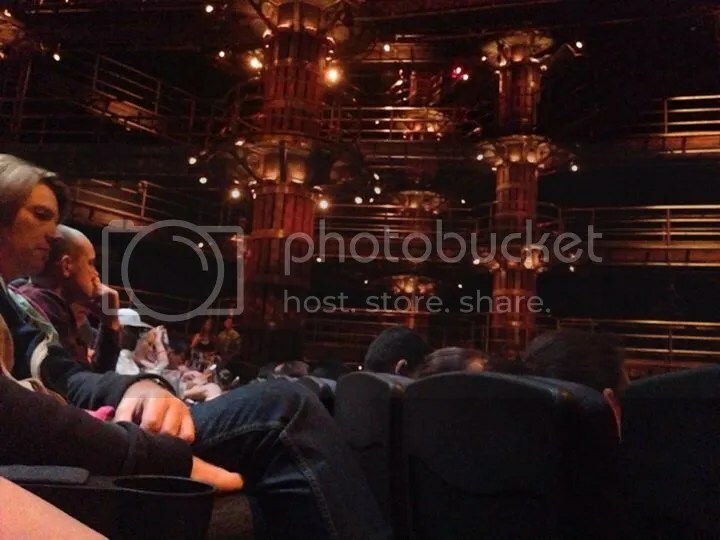 Even though Katie had already seen KÀ, we headed over to MGM Grand to enjoy a night full of music, choreographed fight scenes and much excitement with her friends Stacey, Rachel, and Devon. We had purchased the tickets earlier over the phone, which was a big fiasco with multiple phone calls, hanging up on a vendor, calling back to get it done faster with another vendor and then finally heading to the ticket booth to have the seats moved so we could all sit together. We did the whole process right next to the booth, but were not allowed to use it due to our buy-one-get-one $5 deal. Though, they normally sell the tickets buy one get one $10 as long as you don’t pick the cheapest ones. Just ask them about it. 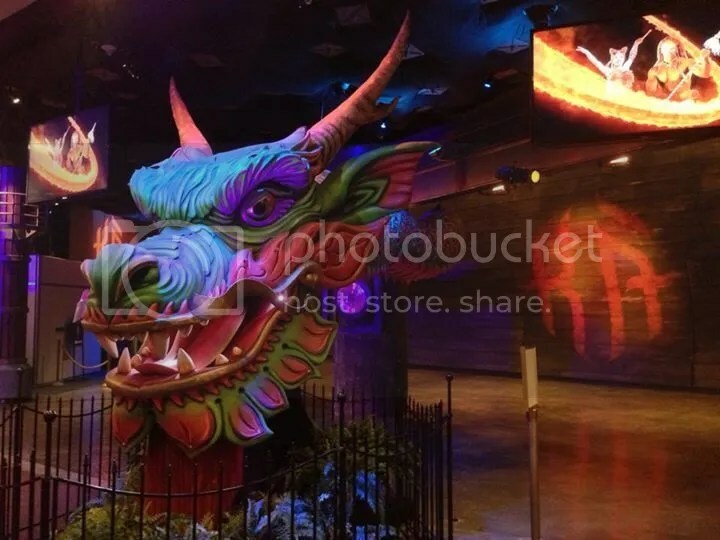 As we walked in towards the entrance there was a huge dragon head with vibrant colors. People stood in front to get their picture with it. Thinking about it now, I’m not quite sure how or where it fits into the story of the show, but it looked pretty cool. 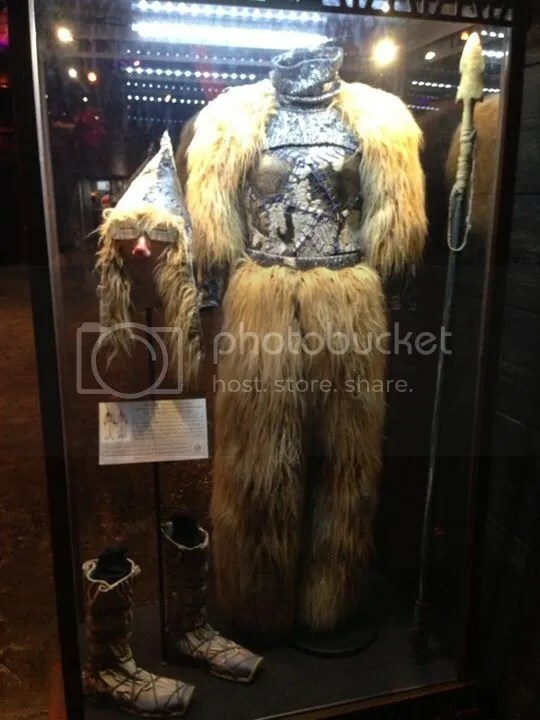 There were also costumes of the characters in glass cases and the “Wheel of Death” that were used during the performance on display. Unfortunately, cameras were not allowed inside once the performance started so these are the only pictures of the show I have. As we walked into the theatre the set completely encompassed us. Looking up we could see steel structures with bridges and different levels all around. The performers were walking down the aisles of the theatre, above our heads and on the ledges. They sent baskets back and forth across the wires along the ceilings and then unexpectedly started jumping from the bridges and swinging above us. The energy of the room slowly built until they were all chanting towards their leader on the front stage. It was a very metallic, slightly scary and evil feeling to the whole thing. The show had begun. Kà is a story about two twins that get separated and their individual journeys as they finally find each other and are brought back together. Instead of telling you the story step by step and what happens I am going to share some of my favorite scenes. Thinking back to the show there were a lot of interesting, awe inspiring, and fun things that I would like to share, but I will try to keep it to a minimum as to not spoil the show if you are ever in Las Vegas and decide to go see it. The first scene that I thought was very unique was where the twin brother and the court jester made shadow puppets on the wall in the forest. The music was so calming as you watched their spirits lift from devastation after the separation to hopeful that things would work out. The shadow animals such as bunnies, dogs, cats, and birds interacted with each other and sometimes their four hands would create one animal. I had never seen anything like it. I also really liked the rotating wall that they used in many scenes. The first scene they used it in the girl and her helpers fought off the evil men as the wall spun around sending some to their deaths. 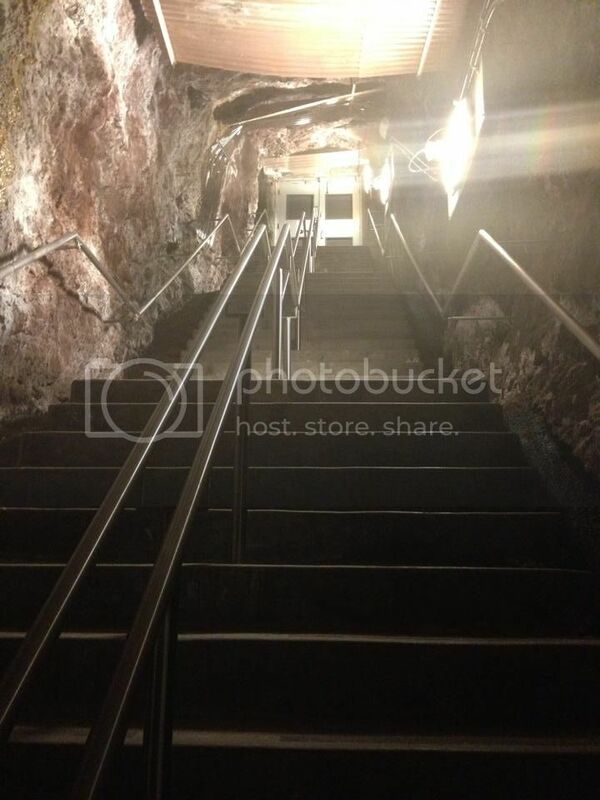 They would slide down toward the bottom and fall off into the empty depths below. I was intrigued and couldn’t pull my eyes away knowing how dangerous of a stunt this was for the performers. One wrong step and they would surely be hurt if not die from the drop. And I had heard that in a previous show just that had happened. 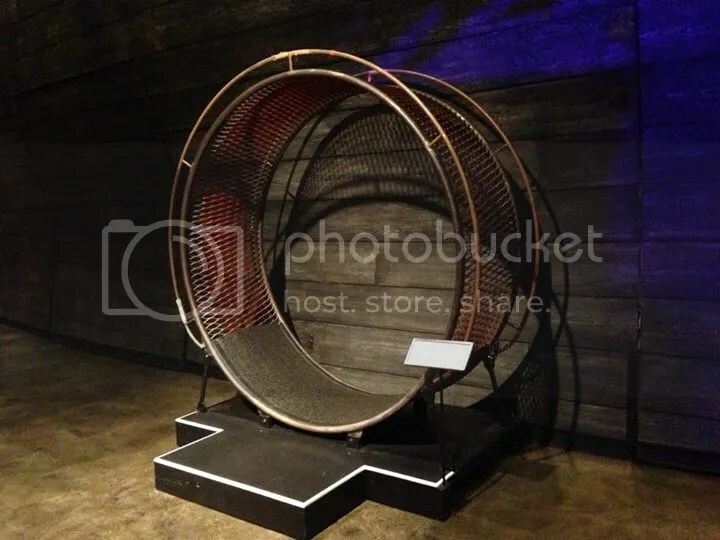 The captivating spinning wheel of death scene was amazing. In the story it was used to make the twin’s people crush the bones of their fellow friends into a powder. With some performers inside the huge wheels walking them around, others performed an almost areal routine outside the wheels. One even attempted to do jump rope while spinning around outside the wheel. It was crazy and once again I couldn’t pull my eyes away. As the story continues the twin sister falls into the jungle where the firefly boy saves her life. Their aerial silk routine was absolutely beautiful as they swung together and around each other and fell in love. They hung from each other high above the stage, mirrored each other’s movements when they were separate and twisted back together to become one person. The final fight scene on the wall was pretty intense. The wall stood straight up and down and it looked like you are watching a video game from above. 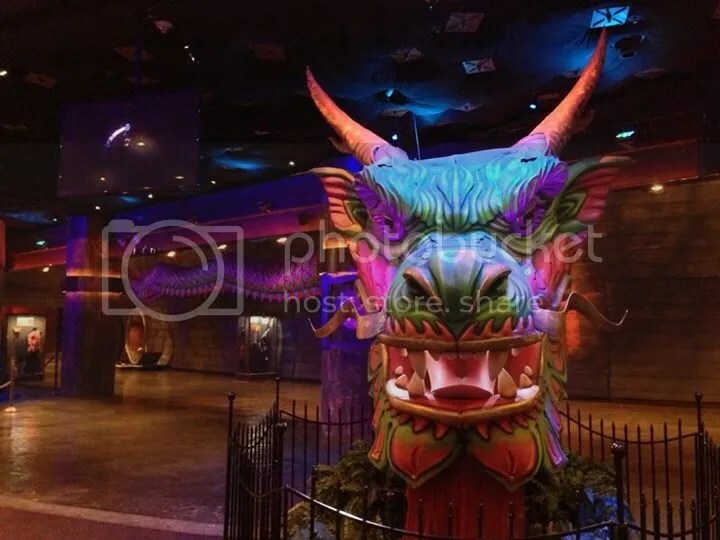 The performers would climb the wall, running up it, jump off it and slide back down it as the fought. With each of their foot steps they would leave a giant print behind that only added to the scene. It was so cool. While the end of the show was very quick and a little confusing to me it follows the story exactly. Over all, I thought the show was really good and entertaining. There were ups and downs, highs and lows, and the stunts were incredible. I don’t want to give it all away so I’m not going to share anymore, just know this one thing. Get there early, after the performance was over we found out there are actually several opening performances. Make sure you don’t miss them like we did. Katie and I were in Las Vegas for a long weekend. 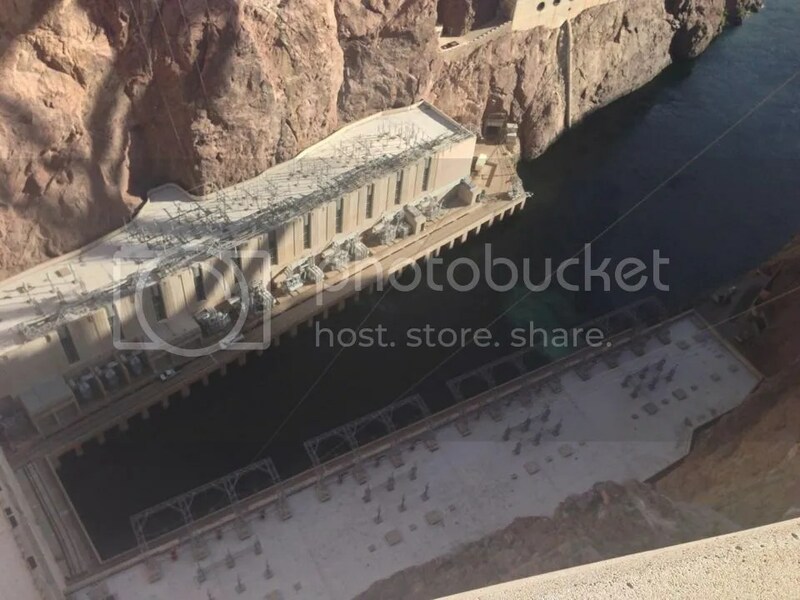 Having never been to the Hoover Dam I was hoping for an opportunity to check it out knowing that it was less than an hour away. One afternoon we jumped into the car and headed toward the border of Nevada and Arizona where the world re-owned structure was built and still stands today. 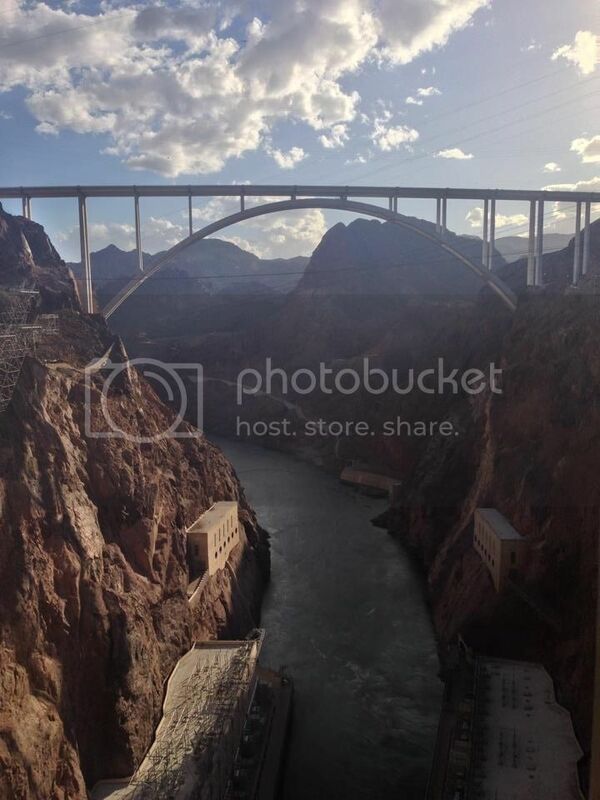 The Hoover Dam sits along the Colorado River. 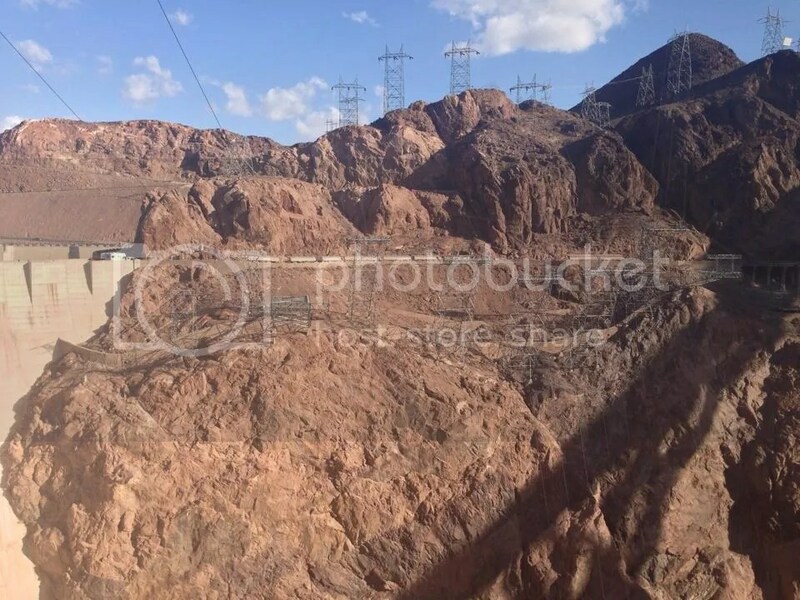 Above it is the man-made Lake Mead, below it lies the Hoover Dam Powerplant. 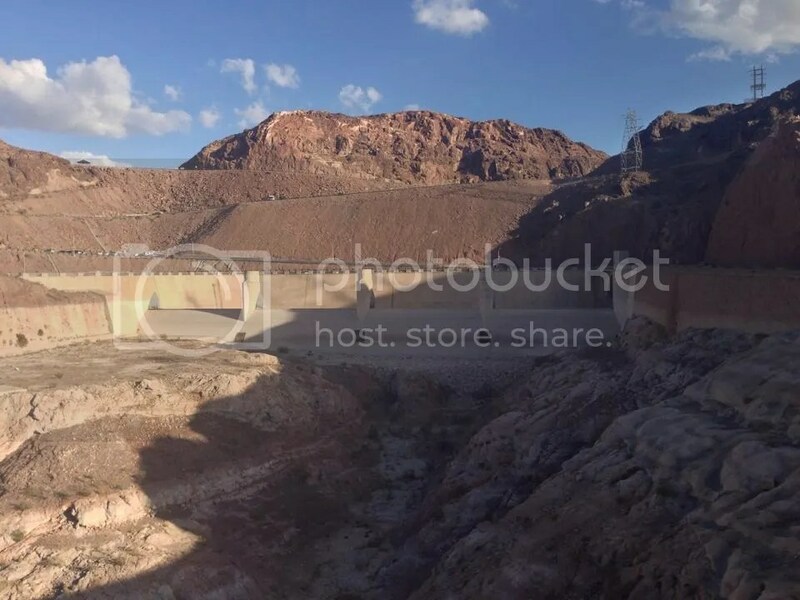 The dam was built during the depression and took less than 5 years to finish. It is a National Historic Landmark and has been rated by the American Society of Civil Engineers as one of America’s Seven Modern Civil Engineering Wonders. Before the Depression water would flow down the Colorado River unhindered. Depending on the season and the amount of runoff from above, the cities below would be saved or destroyed by the relentless waters. 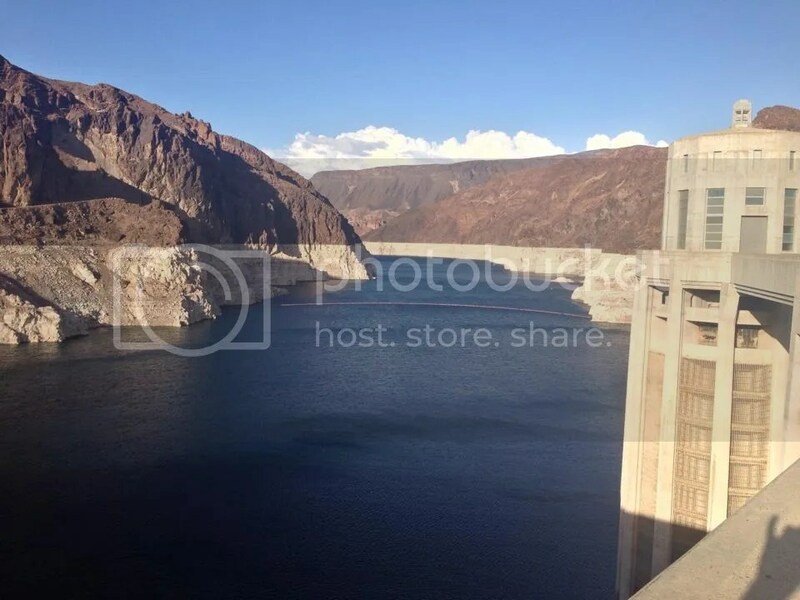 The Hoover Dam was built to tame the river and protect the cities below from anymore harm that might come to them. 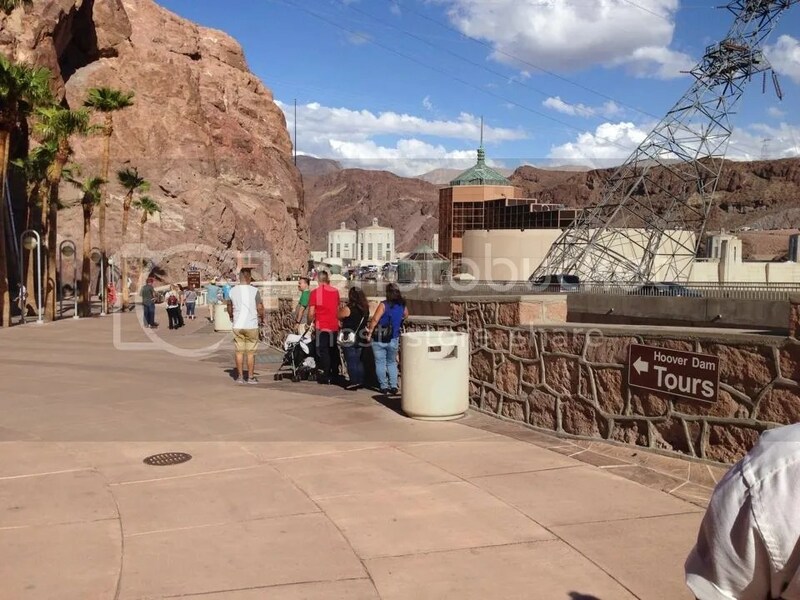 As we arrived at the Hoover Dam I got my first glimpse of what everyone had been talking about. However, for some reason I was a little unimpressed by it’s size. Maybe it was due to the bridge they built right nearby which seemed much more amazing to me or maybe I just needed to get a little closer to grasp the immensity. We followed the signs and next thing we knew we had drove over the top on a narrow two way road only about 45 feet wide. Realizing that the Visitor Center was on the Nevada side we back tracked to find a spot to park. Inside the center we walked through a metal detector and had our stuff checked. 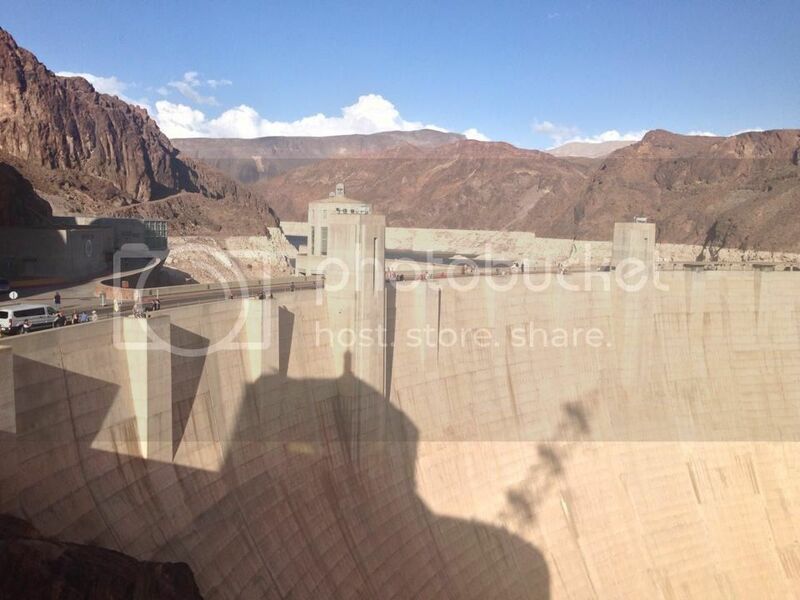 Apparently they are very worried someone might harm the Hoover Dam and the Powerplant. We walked up to the ticket sales counter and asked about the tours for the day. 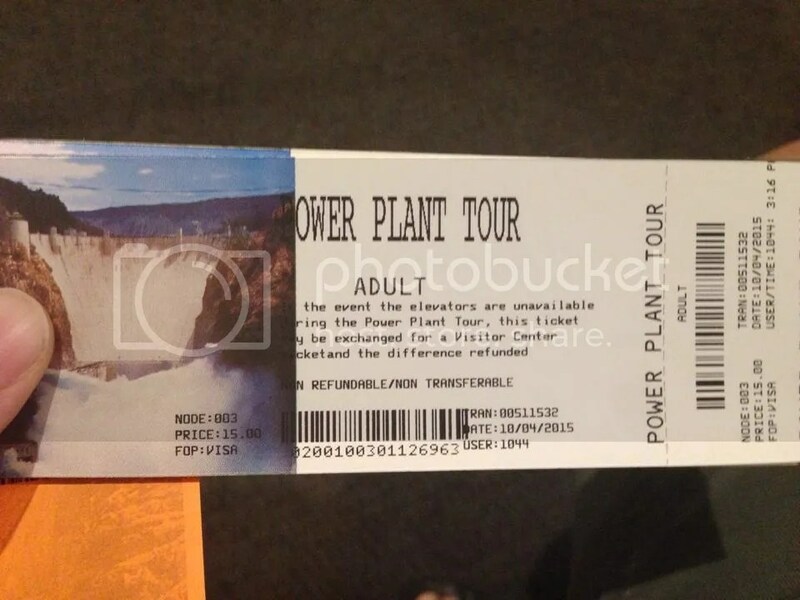 The only tour that had open spaces left was the Powerplant Tour so we got two tickets, at $15 each, and made our way to the front of the line. Along the way we took a picture at a green screen, received a ticket to view it later, and sat down on the bench as we waited for the next tour to begin. 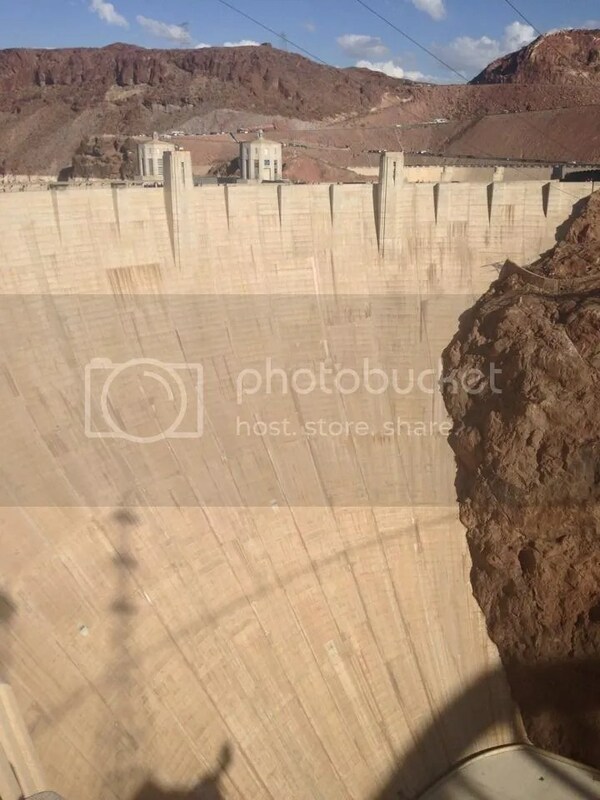 While we waited we read up on some Hoover Dam facts. 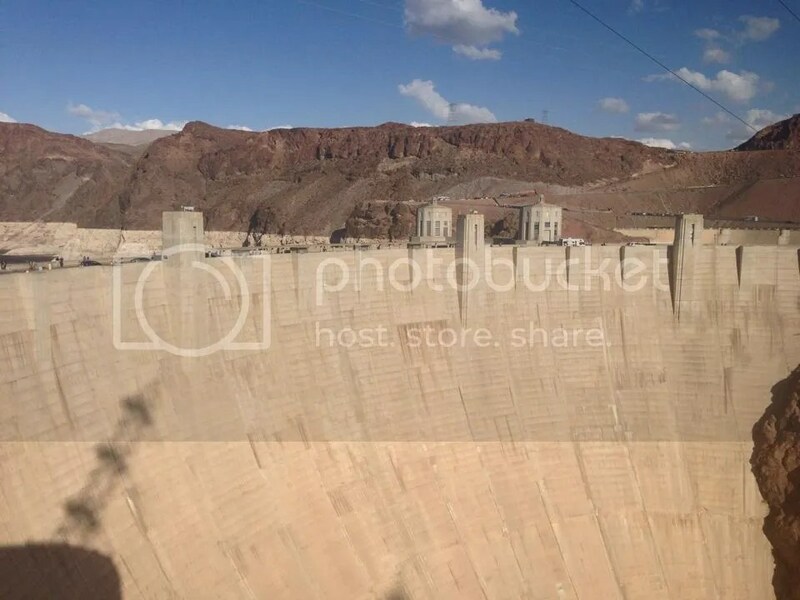 The Hoover Dam is 726.4 feet tall from the foundation rock to the roadway on the crest of the dam. It is only 45 feet thick at the crest, but 660 feet thick at the foundation. It is 1244 feet long spanning across the Colorado River, weighs 6,600,000 tons and contains 3,250,000 cubic yards of concrete. 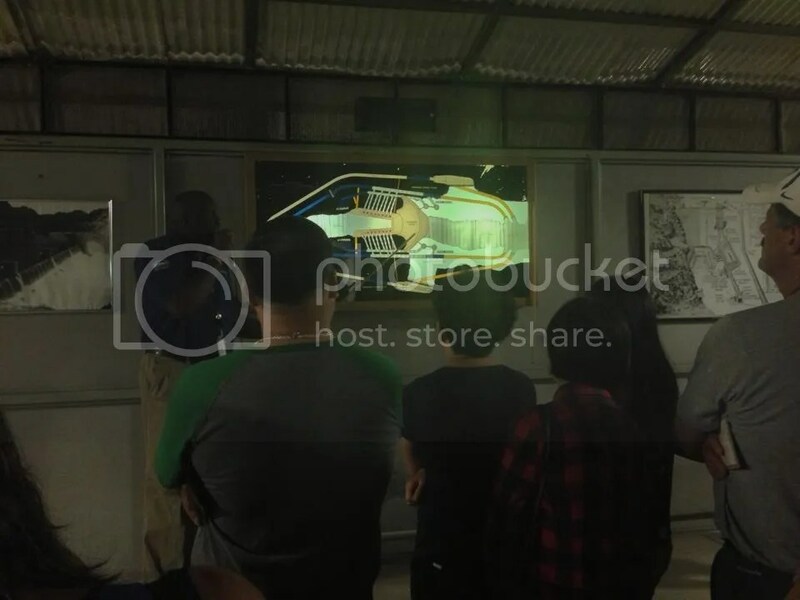 Our tour finally started where we were guided into a small theater to watch a short film about the construction of the Hoover Dam. It was really interesting to see the old black and white film of how they diverted the river, built small dams, and filled the square boxes inches at a time to finally create the enormous structure we see today. 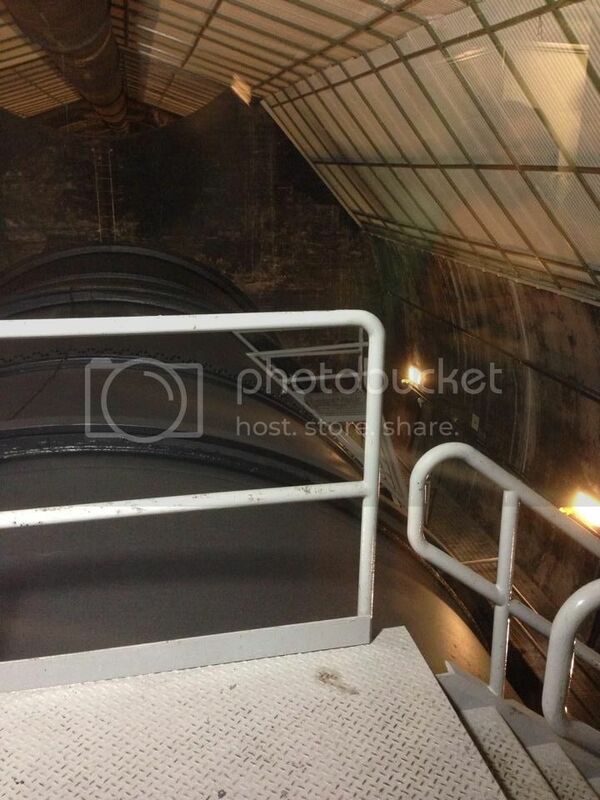 After the film was over we took an elevator down into the dam. Here our guide spoke to us about how the Colorado River was diverted through 4 tunnels around the dam that still sit there today, one of which we were currently standing in, and how the workers also built two smaller dams, one to stop the water from reaching the dam construction site from above and another to stop the water from backing up onto the powerplant below. After the tunnels and dams were finished they opened the tunnels and allowed the water to flow through and around the dam site. When the dam was finished they closed three of the four tunnels, allowing the water levels to slowly rise before closing the final tunnel for good. As they built the dam, inches at a time, but 2 years faster than anticipated there were over 100 deaths. Rumor has it that some of these bodies were buried within the dam, but it is highly unlikely. 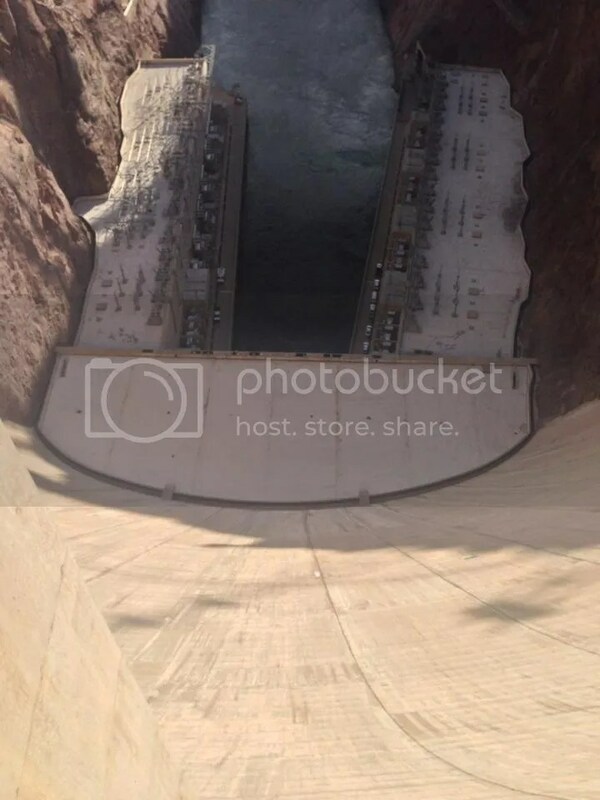 The rate at which the dam was built, literally inches at a time, allowed anyone that accidentally fell into the concrete to basically just step back out easily. Plus, if that was the case and someone was buried within it would cause serious structural damage that would weaken the dam. There were however 96 deaths identified as official “industrial fatalities”, which allowed the deceased’s family to obtain compensation. There were also another 96 are individuals who died from from pneumonia, what is now believed to be a cover which allowed the Six Companies to prevent payment of death benefits to those families. As the dam’s construction neared it’s end there were 2 spillways built, one on each side. 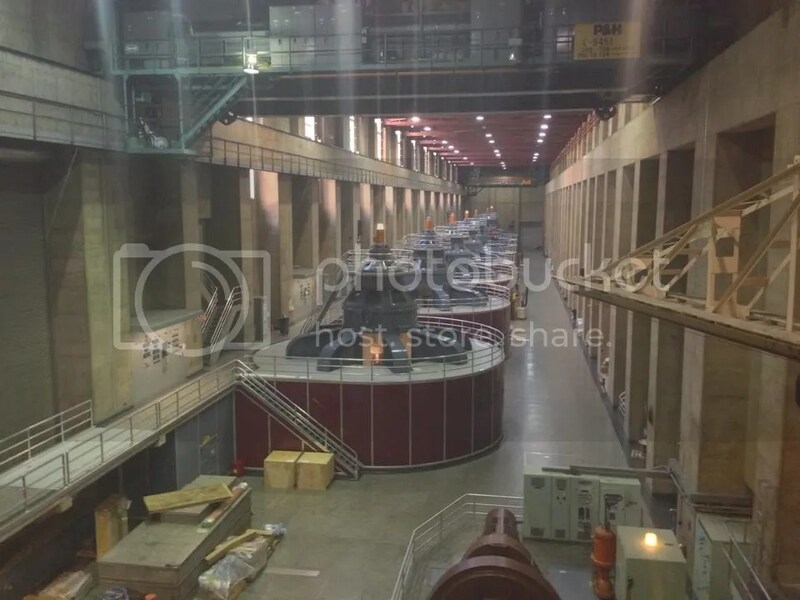 These would aid in sending the water safely around the power plant if the waters ever got too high hopefully prevent the water from going over the top of the dam and landing directly on top of the power plant below. 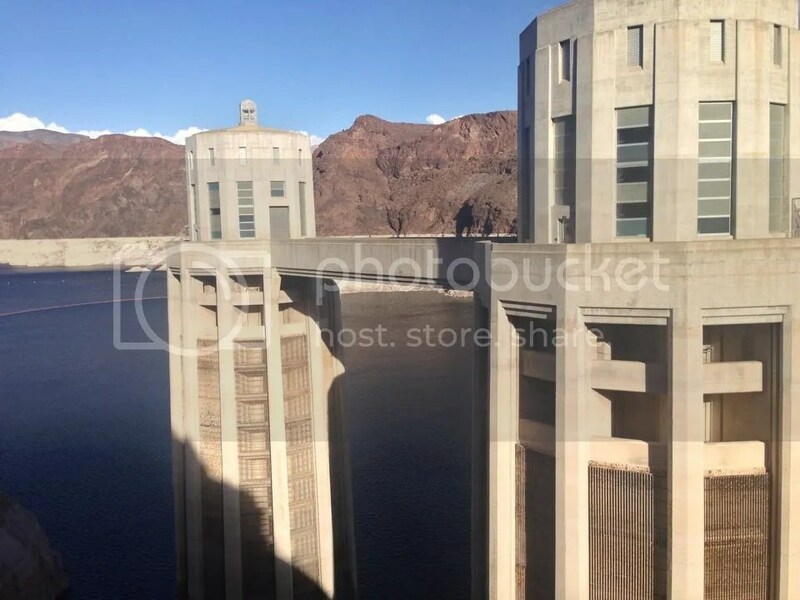 These have only been used twice in all of the Hoover Dam’s life. Once for testing purposes and once in 1983 when water levels rose allowing more than 2 feet of water to flow over and through the spillways. 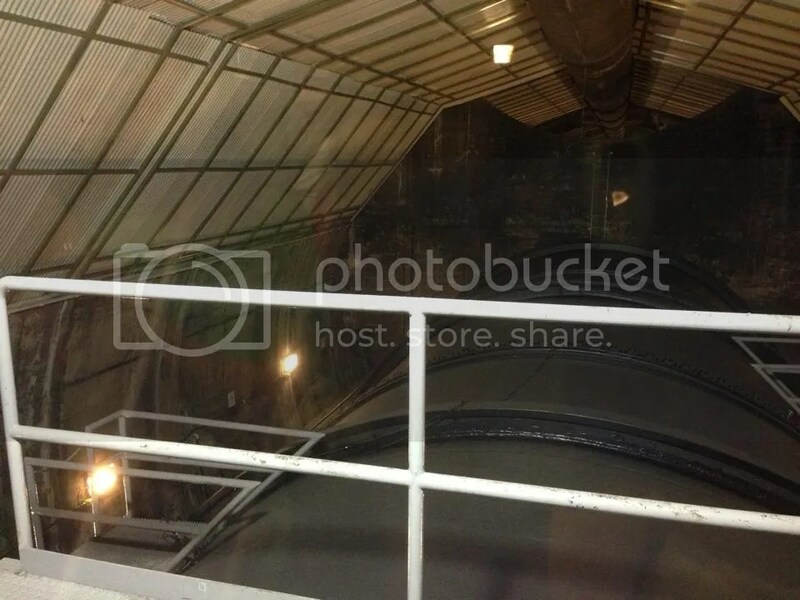 Our tour took the elevator again, but this time moved onto the powerplant. We walked down a hallway and into a huge room the size of two football fields that was very echoey and loud. As our guide spoke I could barely hear him even though he was using a microphone. He spoke about the generators, how they work and how the water is used to cool them down. There were three generators running while we were there. We could tell by the light on top of them. He also spoke about the huge crane that could lift heavy the center pieces out of the generators if there was ever a need for repairs. We headed back to the elevator and to the main floor. Our tour guide finished with a little bit about how the dam is actually 36% below water capacity right now and how there only has to be 260 ft in the dam to reach the water intakes. I asked him what happens if the water gets too low and he only responded with a slight I hope that never happens, but also almost as if it was impossible to happen. Our tour ended there and we headed to the overlook which was soon closing at 4:30pm. We got an amazing view of the dam there and could hear on the speakers a little bit about the cable cars that run along the far side. We then headed to walk over the dam where we could see just how low the water levels really were. 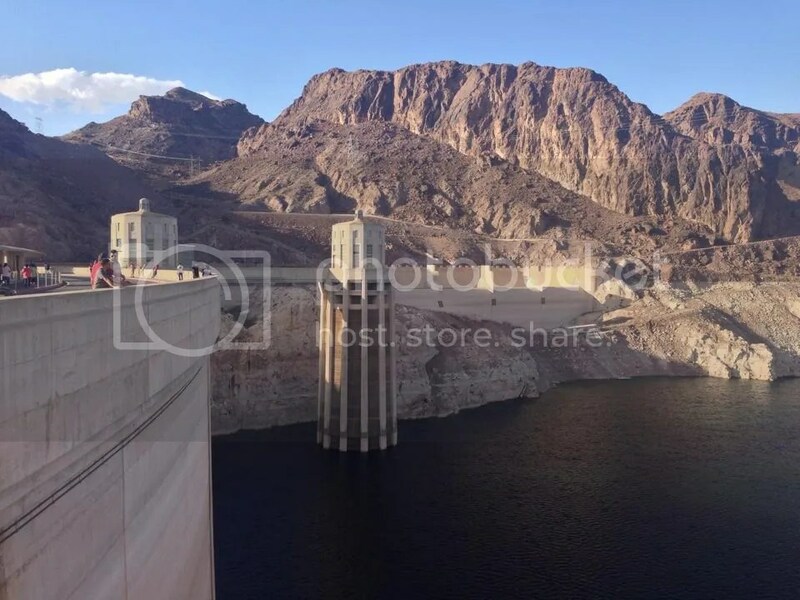 There were clear lines of pure white rock with darker rock above it and I wondered if that was were the water level was when the dam was first created or if the line was created by something else. Without any more guides around I could only guess. We walked and took pictures over the dam and that is when I finally realized how magnificent it truly is. I just needed to get up close and personal to understand the what everyone was talking about. As I peered over the edges and down to the water below the sheer size had finally sunk in and I now knew why everyone is so impressed. We stopped on the border between the two states and I stood straddling the line, in two places at one time. 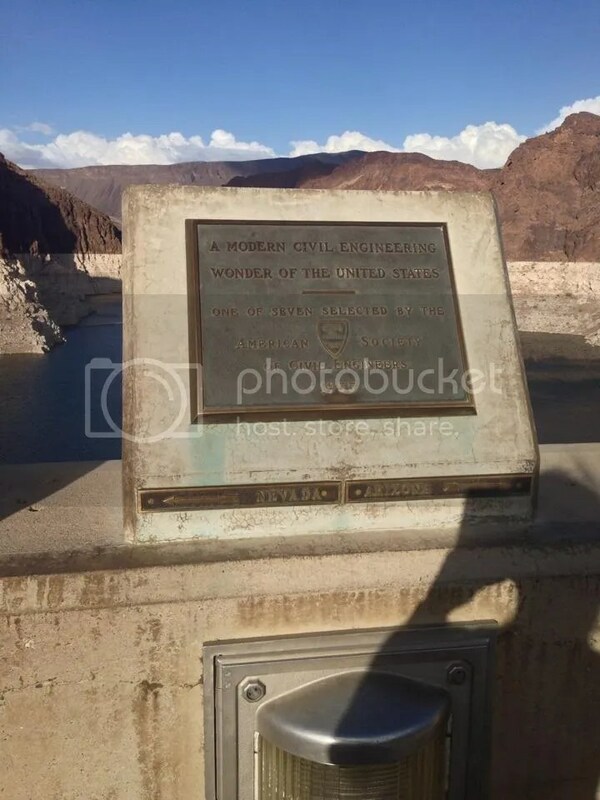 I was glad I had finally made it to the Hoover Dam, a place were almost every Californian has visited at one time in their life. Arriving in Las Vegas late after a long drive I wanted some food. I did a quick Yelp search and found that there’s a little pizza place called Secret Pizza that was about .3 miles from where we were staying, in Paris. We headed out following Google Maps’ instructions and soon came to a dead end. This place really is secret. With so many people walking the strip every day not many know about it. And wIthout having the guts to ask around, good luck finding it. Even Siri was out of her league on this one. I’m not one to spoil the fun of finding the place for everyone so from here I’m going to talk in pretty general terms. We came to a casino and knew that it was somewhere close. We headed inside and searched the entire casino floor. Eventually we happened to pass someone that was talking about Secret Pizza. We did what any normal person would do and asked, “Where is Secret Pizza?” We got a hesitant and general direction and headed that way. 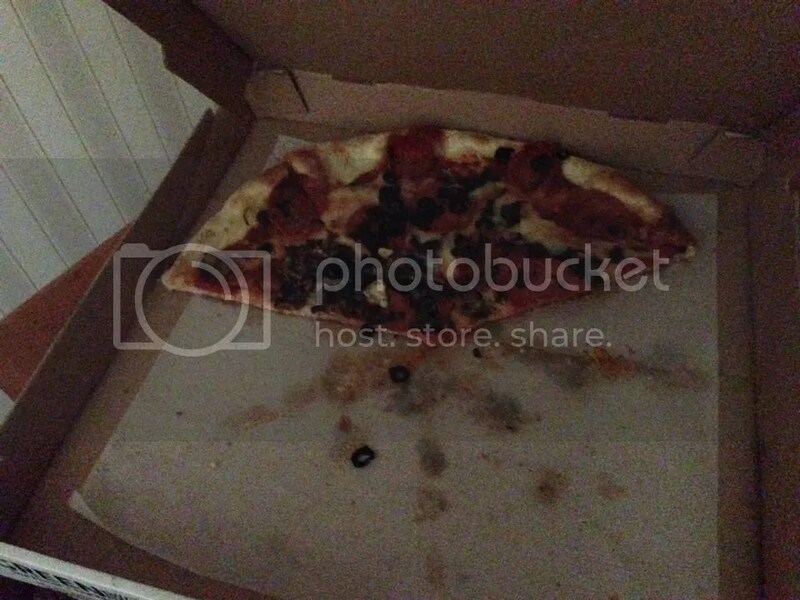 We finally found Secret Pizza. As we got close we could smell the Italian freshly baked pizzas aroma in the air. We followed our noses to a red tinted hallway lined with all different iconic and not iconic records behind glass. We made our way halfway down to the end of the line. There were many drunk people waiting their turn noisily for their after midnight snack. Some hoping the greasy pizza would aid to end their drunken stupor while others only wishing the pizza would stop a hangover the next day. They made quite a ruckus and put on an entertaining a show until one of them stepped on Katie’s foot. Then they became just plain annoying and we secretly wished they would leave the line before they reached the beginning. Those few non drunk people agreed with us as we made small talk as we patently waited to reach the front of the line. 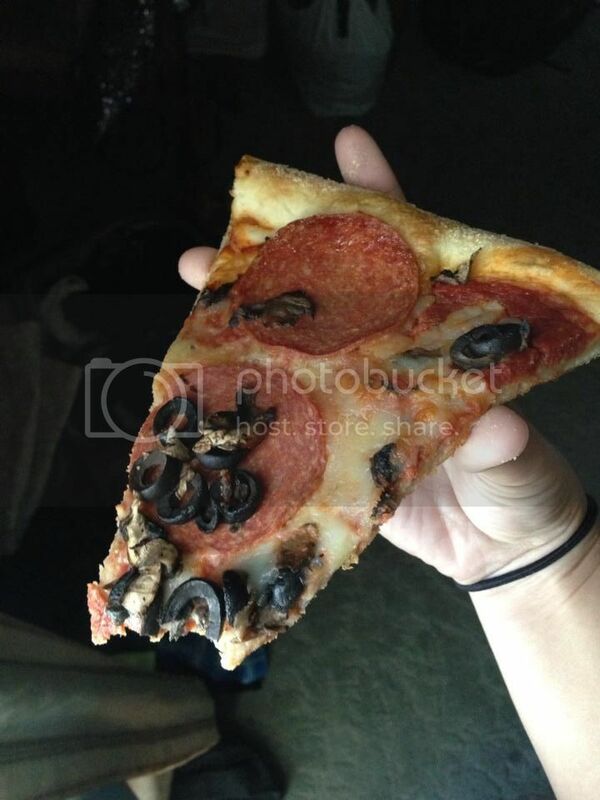 We ordered a large pizza with mushrooms, olives, and pepperoni so that we would have extra for Stacey, Rachel, and Devon the following morning. Yelp had said that Secret Pizza was a 1 dollar sign place, but I must say we paid $38 for our pizza which I do not think is cheap even subtracting the $5 they make you tip. I can only justify this by saying maybe it is cheaper if you are paying by the slice, they didn’t have prices up where you could read them so I do not know their per slice price. Or maybe it is cheaper compared to other pizza places on The Strip. However you feel about the price, I do think the whole large pizza was worth the $32. We had it for dinner and breakfast the next morning. 25 minutes later we returned to pick up our pizza and blew past the what was then twice as long line that we had originally stood in. We made our way all the way back to our room in Paris before we dug in. It was delicious! Possibly the best pizza on The Strip. The pepperoni was on point as was the mushrooms, olives, sauce, and cheese. The following morning the pizza was still good. Everyone except for me thought it was even better. I just wasn’t happy that the grease had settled and made the center soggy by then. All in all, if you can find Secret Pizza you should definitely give it a try. The pizza is well worth the wait, even if you think you are about to pass out and won’t make it to the beginning of the line.